Irish Red and White Setter and the Irish Setter share the same ancestry and were both popular in Ireland in the 18th and 19th centuries. However, when the Irish Setter gained popularity, the Irish Red and White Setter became quite scarce and at one time almost disappeared. The breed was reestablished in the early 1900s and is now flourishing. The Irish Red and White Setter stands between 22 and 26 inches tall and weighs 40 to 70 pounds. The head is broad, eyes dark and oval, and ears dropped. The body is strong and slightly longer than the dog is tall. The tail reaches to the hock. The coat is short and flat with feathering on the ears, backs of the legs, and tail. The coat is white with red patches and flecking. This breed needs weekly brushing and combing to keep the coat neat and clean and to prevent matting. Most breed experts recommend that the coat be trimmed under the ears, under the tail, and around the feet. 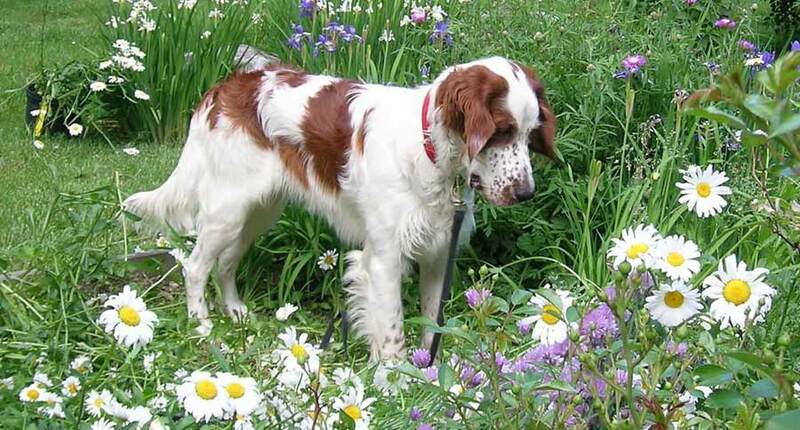 Irish Red and White Setters are hunting dogs with strong instincts and great stamina. They need daily exercise and will run alongside a bicycle, go jogging, or enjoy a vigorous game of catch. All exercise should be on leash or inside a fenced-in yard. Irish Red and White Setter puppies who do not get enough exercise will get into trouble. These dogs are friendly and intelligent. Although they are easily trained as gun dogs, they do not always take well to rote obedience, so training should be firm, patient, and consistent, yet not harsh. The Irish Red and White Setter breed does enjoy active, fun canine sports, especially agility, flying disc, and flyball. Irish Red and White Setters have also been successful search-and-rescue dogs. The Irish Red and White Setter does best with an owner who hunts or enjoys field trials; those instincts are strong in this breed. He is good with children when raised with them or well socialized to them. He is usually good with other dogs but may not be good with smaller pets. Health concerns include bloat and cataracts. Share your Irish Red and White Setter story. Note: Upload only Irish Red and White Setter picture or your picture with Irish Red and White Setter below - spammer's ip may be blocked.